Every ’80s kid loved C.H.U.D. Even if they didn’t love the movie, they loved the idea of it. They loved the fact that the title was an acronym for “Cannibalistic Humanoid Underground Dwellers” (well, sort of); they loved the purple tint to the cover that looked like nothing else on the shelves; they loved the symmetrically-framed image of the dank alley and the manhole opening slightly with the tagline “They’re Not Staying Down There Anymore!”. Because of this, director Douglas Cheek’s smart, grimy opus was a hot rental and one of the first cult films of the decade to sneak its way into the pop culture dialect. But was C.H.U,D, any good? For this writer’s money, yes. 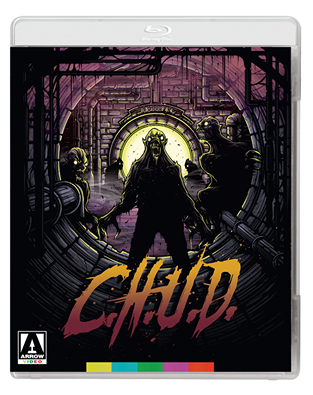 In a sea of mechanical slashers and bids for horror franchise pay dirt, C.H.U.D. was a serious-minded, New York-flavored bio-thriller with a focus on eccentric, defined characters, a social soul and some alarmingly cool creatures, courtesy of FX wizards Caglione and Drexler. It didn’t aim to be a horror movie, it didn’t try to be quickie product. It was simply aiming to be a good film, full stop and if it stops just shy of excellence, you can blame lack of budget and perhaps too many ideas and character arcs and just not enough running time to fully flesh them all out. But otherwise, C.H.U.D. was and is a solid piece of genre entertainment. The film stars John Heard (Cat People) as a Manhattan photographer who lives with his pretty girlfriend (Brazil‘s Kim Griest) and whose work focuses on the struggles of the city’s homeless. When he hears rumbles of some sort of disease spreading through the sewers and subway tunnels, affecting and infecting the transient people he has befriended, he investigates, slowly suspecting that some sort of waste from above is the cause of the sickness. Meanwhile, a wild-eyed soup kitchen worker (Daniel Stern, Diner) is also on the trail and aggressively begins making noise and a cynical police detective (Christopher Curry) also suspects something’s up, especially since people keep vanishing without a trace and, in some cases, are found torn to bloody shreds. Eventually, these three diverse men wind up on the same page and discover that due to toxic chemicals dumped by an evil corporation, the forgotten citizens below are being turned into hulking, toothy, bug-eyed monsters that devour each other and whatever privileged members of the surface world they can catch. Can the C.H.U.D.s be stopped? Arrow Video have dragged this 32-year-old one-shot classic from the dank pits of history (the in-name only sequel was re-released by Lionsgate recently too; it’s a stinker) and given it the double disc treatment, packing the back end with extras both fresh and ported over from previous releases, including a riotous commentary from Heard, Stern and Curry pulled from the 2001 DVD. Most importantly, they have included both known cuts of the film. The version released to theaters and domestic home video via New World Pictures and Media Home Entertainment respectively, runs 86 minutes and is the one that most of us were raised on. But the 96-minute cut is the superior edit. I remember catching C.H.U.D. on network TV in the late ’80s and was astonished to see a very different film. Although what little gore and profanity there is in the picture was removed, extra scenes that fleshed out characters as well as a remixed ending were present. The TV cut of C.H.U.D. was superior. These extra scenes were edited into the uncut version released via Anchor Bay on DVD at the early part of the decade, a cut that has since been referred to as the “integral version”. In it. we learn that Griest is pregnant and, most importantly, that Curry’s wife was in fact the woman pulled down into the sewers by the C.H.U.D.s in the opening pre-credits sequence. We see Curry reacting and breaking down when he discovers her body and it’s this moment of tragedy that really defines his character and obsession with the case. Why it was cut is anyone’s guess. Also of note is the ending. In the theatrical cut, a tacked on climax features a young John Goodman as a cop in a diner under attack from the monsters. It’s a nihilistic and nonsensical finale to the picture that never really worked. In the integral cut, that scene is edited into the body of the movie to signify that the C.H.U.D.s are out of the sewers and on the move. Much better. Watching C.H.U.D. again I had a few fresh thoughts that I never considered before. The creature designs recall adult versions of the babies from Larry Cohen’s first two It’s Alive films. 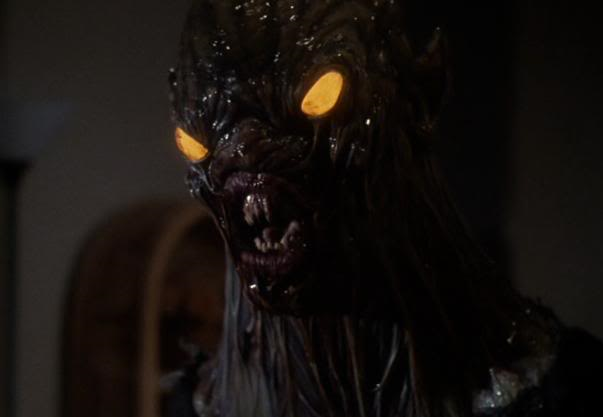 And when Cohen made adult versions of the babies in 1987’s Island of the Alive, they looked like C.H.U.D.‘s. And a huge part of the climax of the first It`s Alive centers around a search and shoot out in the sewers. Also, Eastman and Laird premiered their first issue of Teenage Mutant Ninja Turtles in 1984, the same year C.H.U.D. was released. Both films see a toxic chemical birthing mutant monsters that live in the sewer. And don’t those wiseacre turtles look a bit like C.H.U.D.’s too? Also, Stern and Herd ran around New York City almost a decade later in Home Alone 2: Lost in New York. Would it have killed director Chris Columbus to have thrown at least one C.H.U.D. reference in there?